Throughout his career, Christian Jankowski has developed a conceptual art practice that ranges from mass-media to fine arts production. 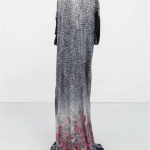 This has lead Jankowski to collaborate with several media outlets, synthesizing performative elements into videos, sculptures, photographs and site-specific installations that challenge old parameters and suggest new ways of image production through questioning the images which circulate in mass-media and reflecting upon the current role of art in society. The work of Christian Jankowski is a performance, which engages often-unsuspecting collaborators to innocently collude with him, making them ‘co-authors’ of the final result. They often (sometimes inadvertently) participate in the very conceptualization of the work. The collaborative nature of Jankowski’s practice is paramount, as each participant unwittingly contributes his or her own texture. There is as much emphasis on the journey as the destination, and the risks and chances inherent in his collaborations ultimately give surprising shape to the final works. Adrastus Collection is proud to announce the most recent acquisition titled Churchill from Jankowski’s 2017 series “Walking Logic”. While visiting Bratislava, Christian Jankowski happened upon a folk art shop and became intrigued with hand-carved walking sticks. These objects have been used as a support, a weapon, and symbol for the wanderer for thousands of years. They are also among the first tools fashioned and decorated by men, anchoring them within the early history of art. Jankowski was particularly interested in these walking sticks because they had faces carved into their handles—representations of animals, ghosts of the forest, and other mythical characters. In order to better understand the craft and history behind this form of folk art, Jankowski met with the 77-year-old woodcarver, Oldrich Richter, who made these traditional walking sticks. Churchill (Walking Logic) (2017) is part of the series of walking sticks commissioned to Mr. Richter. Jankowski leans each of these walking sticks against the gallery walls and uses them to hold in place images illustrating the use of such sticks through the ages: from ancient Egyptian wooden figures to Pope John Paul II to Leonardo DiCaprio. A surprising dialogue arises from the juxtaposition of the carved wooden faces and the illustrated faces. In this piece, the walking cane is inexorably linked as symbol of power, experience and obduracy. With his trademark bowler hat, walking cane and cigar, Churchill came to symbolize the ‘”bulldog spirit” of the British people. 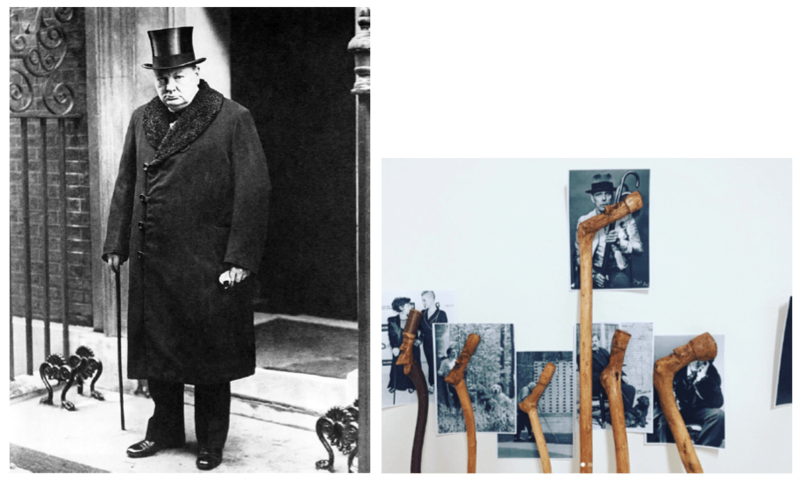 Undoubtedly, Churchill (Walking Logic) (2017) holds a deep historical legacy with the walking stick primarily associated with relations of power and exhaustiveness. Christian Jankowski lives and works in Berlin. He was born in 1968 in Göttingen, Germany and studied at the Academy of Fine Arts, Hamburg, Germany. Recent solo exhibitions include Haus am Lütowplatz, Berlin, Germany (2016), Kunsthaus Hamburg, Germany (2015), Center for Contemporary Art, Ujazdowski Castle, Warsaw, Poland (2013); Sala de Arte Publico Siqueiros, Mexico City, Mexico (2012); MACRO, Rome, Italy (2012); Nassauischer Kunstverein Wiesbaden, Germany (2009); Kunstmuseum Stuttgart, Stuttgart, Germany (2008); Miami Art Museum, Florida, USA (2007); MIT List Visual Art Center, Massachusetts, Cambridge, USA (2005); Swiss Institute, New York, USA (2001) and the Wadsworth Atheneum, Hartford, Connecticut, USA (2000). He has participated in numerous group exhibitions Including ‘Autogestion’, Joan Miró Foundation, Barcelona, Spain (2016); ‘When I Give, I Give Myself’, Van Gogh Museum, Amsterdam, The Netherlands (2015); Project Los Altos (off-site show in Silicon Valley, staged by San Francisco Museum of Modern Art, USA, 2013); Taipei Biennial, Taiwan (2010); Sydney Biennial, Australia (2010); the Whitney Biennial, New York, NY, USA (2002) and the Venice Biennale (2013 and 1999). 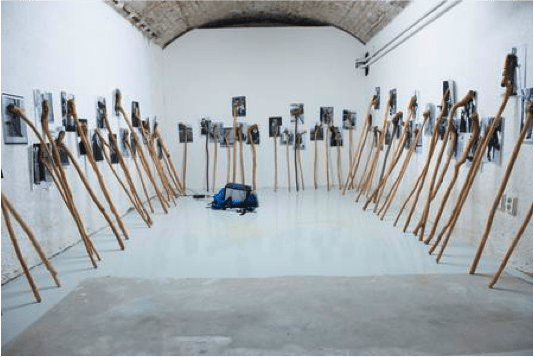 In 2016, Jankowski curated the 11th edition of Manifesta, becoming the first artist to assume the role.